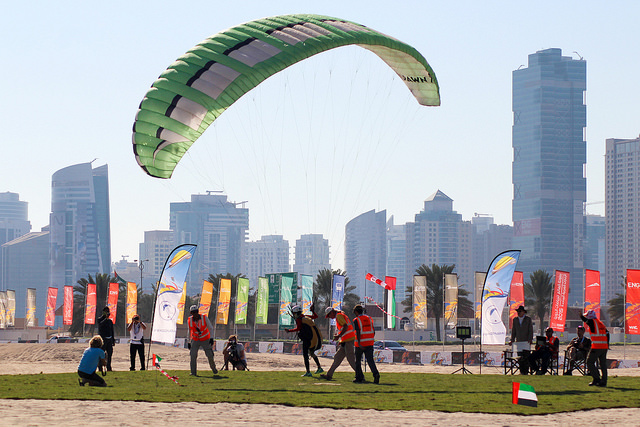 Day two of the FAI World Air Games and it was a challenging start for some of the competitors aiming to hit the target in the paraglider accuracy landing competition at the Beach Dropzone. Reigning World Champion Matjaz Feraric from Slovenia struggled to judge the conditions and landed 28cm away from the target instead of within one centimetre as he'd hoped. "I saw the glider before me left their approach too high and overshot, so I came in lower," he said. "But then I was too far to one side and landed short." For this competition, pilots are towed up into the sky over the beach with a winch, and wear a stud on their shoe so they can be detected by the electronic landing mat. Unlike accuracy parachuting, paraglider pilots, whose wings allow them greater control, must land on their feet for their score to count. And at this level, they expect to get within one or two centimetres of the bullseye. The conditions today (December 2) were smooth and consistent, but the sea breeze that built up over the course of the morning caught a few of the athletes out. "There's no excuse," shrugged Fereric. "Just some tension from competing, and not much time to practise." Fereric wasn't the only one disappointed with his performance. Lithuanian Jolanta Romanenko, who has been practising accuracy landing for eight years, got to fly two rounds. Her scores were 138cm and 59cm, and she looked down-heartened as she packed up her gear. The good news for Romanenko and Fereric is that there are a total of 12 heats to fly and competitors can discard their lowest score. Both could therefore be back in the running tomorrow, when the heats continue between 7am and 10am.